On October 17, 2016, Sun will move into Libra. It will remain here till November 15, 2016. Some changes will be seen in the life of every native owing to this planetary change. Read this article by astrologer “Acharya Raman” discover your fate. 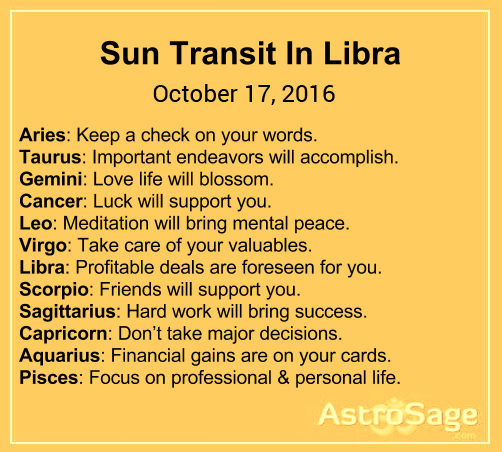 On October 17, 2016, Sun will transit into its debilitated sign, Libra. To unveil effects of this planetary shift, read this horoscope article. Sun will transit in your seventh house. Don’t get angry from your spouse and be calm as far as possible. Keep the conversation normal and decent. Health issues such as headache, pain in eyes and stomach are possible. Keep control on your words. When Sun will transit in Nakshatra of Rahu, it might harm you. Though luck will support, but you might lack concentration. You might do anything wrong. Stay away from those who envy you. You need to behave well with all. Love life might get affected. Expenses are possible on spouse. Any family member might have to face serious health issues. You might face any problem whose reason might not be clear to you. Some of your endeavors will accomplish as well. If you behave right with your authorities, you endeavors will accomplish. Time is good for love life. You will make new friends and they will understand your sorrows. This transit is fortunate for businessmen and for service people as well. Stay away from ego and have control on your words. Don’t interfere in matters of others,. Personal life will go great. Arguments are possible with family members, spoiling family atmosphere. No matter who you meet, you should be polite with them. Have control on yourself before it gets too late. Negativity should not be there in your thoughts. Stay away from discord in office and don’t develop wrong thinking for others. Luck is with you; hence, no need to worry. If you think anything is not right or you are going through Pratyantar or Antardasha if Sun, recite “Aditya Hridaya Stotra” for total of three times at one time regularly. Luck is not that supportive. Any disease might pop up again. You might say something in ignorance which will not only harm, but will also raise questions on your trustworthy nature. You might get into any tiff with your siblings due to your anger. Avoid all these things. Money will be wasted on useless things and you will not be able to control them. You yourself might become the reason for your losses. Meditation will help you, try practicing it. Useless arguments are possible with family members. Conflicts because of you are possible in your in-laws family too. Health might get affected a bit. Pain in shoulders and lower area of stomach is possible. Luck is not that good, but you will get the needed help at time. You might get into tiffs with your spouse, maintain calm. Any valuable asset might get stolen or misplaced. Take care of such things. If someone do anything for you, appreciate it and be always there to help them too. Headache, fatigue, and muscular pain are possible. Time is not good for new agreements. Postpone the date of legal cases, as your lawyer might commit any mistake. You might reject any good proposal and lead to your own financial loss. Personal life might lack bliss. Weakening of tenth house lord will lead to some problems. However, this is not a matter of many days. Love matters will also lack bliss. You might get annoyed over minor things. You will harm your enemies. Friends will help you. You might take wrong financial decision. You might develop habit of doubting others. Friends might forget their promise. Don’t depend on them else you will lack behind. Your own efforts will take you ahead. Give your best and don’t let your efforts fall down. Personal life also need serious attention. Betrayal is possible in love affair. Sun is considered effective in tenth house, but you might not get extreme profits. Your performance might decline and allegations are possible. Mind of students might get diverted from studies. You might miss any major work and any agreement might get canceled at the last moment. Don’t take major decisions in this time. Pain in joints is possible. Financial profits are there on your future cards. Some problems might pop up and embarassment is also possible. Don’t run after money to such an extent that others things get neglected and hopes of others remain unaccomplished. You need to be really conscious at workfront. Your own action might lead to harm for your image. Avoid alcohol or reduce its quantity. When sixth house lord goes in eighth house, opposite Raja Yoga is formed. However, it happens when eighth house lord is posited somewhere in third, sixth, or twelfth house. Extreme profits are not foreseen for you. Enemies might plan strategies against you, which might harm. Losses are possible at workfront and you need to balance personal life too. Your image might get harmed in in-laws family.